About The Site - THE MASSACRE AT LE PARADIS - HELL IN PARADISE - MAY, 1940. John Head, Nick Smith, Dennis O'Callaghan and Peter Steward (seated) at work on this web site. This section of the site explains how it came into being. As a pacifist, war has always fascinated me. But that fascination has always been rooted in horror. The horror of men blindly following orders and blindly stumbling to their deaths for a cause that very few of them understood. Just walk through any war cemetery and you get to understand a little of the scale of the futility. Of course it's easy to look back from the safety of over 70 years and see just how young men were caught up with the promises and propaganda. Particularly in the First World War (named the Great War because of its scale - but really there was nothing Great about it), it was easy to see how the promises of food, lodgings and regular pay was attractive to men suffering hardship at home. The fact that they couldn't see that any home-based hardship would likely be even worse abroad says much for their gullibility. Throw a dollop of patriotism into the mix and you end up with a heady time-bomb. The causes of the Second World War are much easier to identify - power lust and aggression being at the heart. But the devastation of lost life was no easier a pill to swallow. When I am writing about war I always try to hone in on the personal. I am no military strategist. I leave the description of battles and the technicalities of war to others. My interest is in the social side - in people. Trying to work out what makes a soldier tick, what his motivation was and how he faced the ultimate fear. I am rather embarrassed to admit that before starting work on this web site I was unaware of the massacre at Le Paradis. But I found I was by no means alone in my ignorance. I became intrigued by the massacre - again from a social point of view. On a number of occasions I shared a coffee (and sometimes something a touch stronger) with John Head. We soon discovered a shared love of literature, music and history. John told me about regular trips he helped to organise with a schoolboy friend, Dennis O'Callaghan, to Le Paradis. The story of the massacre began to unfold and I became intrigued and voiced a wish to go on one of the trips. Before I knew it I was being whisked over to West Norfolk to meet Dennis, son of one of only two survivors of the Massacre of Le Paradis, to have a look through his treasure-trove of original material regarding the massacre - much of which has never been published before. We all felt it important to ensure that the material lives on in a format that would make the information available to the largest number of people possible. That meant a web site - the one you are reading now. Our main aim was to increase understanding of the massacre - but above all to focus on the human aspect of the tragedy. How could we from the relative peace of the 21st century understand the naked fear of those men who were rounded up and murdered by one of the most evil regimes ever seen? But in the testimonies of Bill O'Callaghan and his colleague Bert Pooley we had first hand accounts of what had happened on that fateful day. I felt that Bill and Bert's stories, despite being featured in a number of books and articles, had never really been fully told. Neither had anyone looked at the small village of Le Paradis in any detail or tried to work out what made Fritz Knoechlein give the order to massacre almost 100 men. What kind of man was he? Then there was the wish to make the web site a memorial to all those who lost their lives and so the idea began to germinate to put together a web site reflecting all aspects of a massacre that would have been over in a matter of minutes. A web site that could help with our understanding of what went on through the medium of memories and original material from Dennis O'Callaghan and Jeannette Hawkes' (Bert Pooley's daughter) collection. And as we got down to work, a number of extraordinary stories were given birth. For this wasn't just a story about the execution of almost 100 people. It was a story about inhumanity, hatred, friendship, power, control and many other things that go to make up the human condition. One of the things that really intrigued me was how something that could only have taken a matter of a few minutes from start to finish has been frozen in time over the following almost 80 years. Ultimately it is absolutely vital that we continue to remember the men who gave their lives on that day in May, 1940. It is important that we understand just what went on in that tiny French hamlet. I hope that in some small way we can add to the understanding of this war crime and I hope you obtain as much satisfaction and emotion reading this web site as much as we have gained from putting it together. 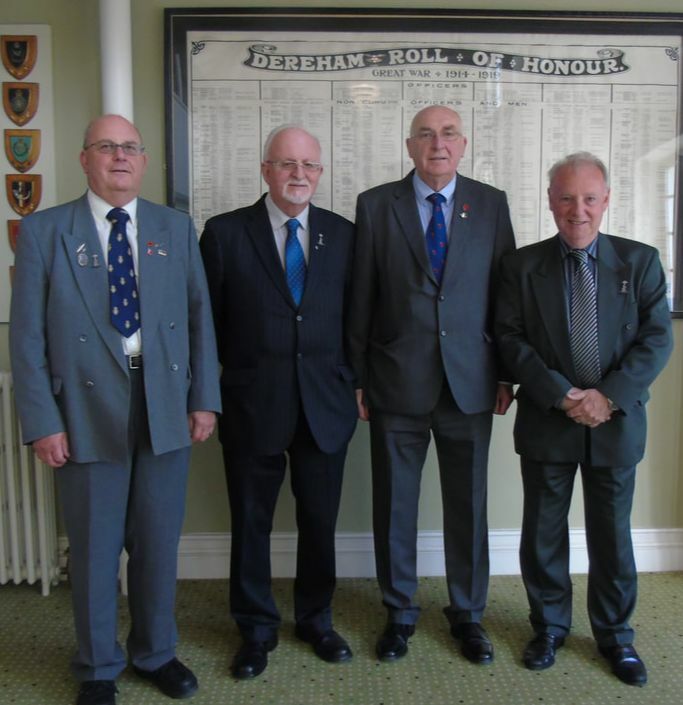 Members of Le Paradis Commemoration Group photographed at the official launch of the website in April 2018 at Dereham Memorial Hall. Left to right: Nick Smith, Dennis O'Callaghan, John Head and Peter Steward.